Did the Vikings discover America? It’s a question that requires some unpacking. To begin with, there’s the problem of the Eurocentric perspective of the word discover, which looks at the encounter with the New World from the vantage point of guys on ships and ignores the fact that indigenous people had long been calling it home. In that sense, America was probably discovered by hunters from Asia, who historians believe made their way to Alaska either on foot from Siberia via a land bridge across the Bering Strait during the last ice age or came by boat and continued southward along the coastline. In either case, these people arrived 13,000–35,000 years ago—so long ago that their descendants are considered the continent’s indigenous peoples, Native Americans. Rephrasing the question, we can ask instead whether the Vikings were the first non-Native Americans to encounter America. The answer to that question, however, hinges on what we mean by America. If we are referring to America broadly—meaning North and South America—there is a possibility that Polynesians got there first. Genetic analysis of the sweet potato, which is native to America, has led scientists to conclude that Polynesian explorers had an early encounter with South America and took the sweet potato with them to Southeast Asia and the Pacific Islands. Scholars are convinced that this exchange took place before the time of Christopher Columbus, but they do not know whether it preceded the visits to North America by the Vikings. Asking whether the Vikings were the first Europeans to encounter America sets the stage for the Vikings-versus-Columbus debate, but first the legendary voyage of St. Brendan has to be reckoned with. According to the epic “Voyage of St. Brendan the Abbot” (recorded in Latin prose sometime between the mid-8th and early 10th century as Navigatio Sancti Brendani Abbatis), in the 6th century Brendan, a peripatetic Irish monk, and some of his brethren sojourned west across theAtlantic Ocean in a bowl-shaped boat known as a curragh (coracle). It has been argued that Brendan reached North America, and a modern experiment proved that it is possible to make a transatlantic crossing in a curragh, but there is no archaeological evidence of an early Irish visit to North America. So it still comes down to Columbus and the Vikings. History tells us that in 1492, while leading a Spanish-sponsored three-ship flotilla in search of a shorter route to Asia, Italian navigator Christopher Columbus happened upon America in the form of Guanahani (probably San Salvador Island, though maybe another Bahamian island or the Turks and Caicos Islands). Another Italian navigator, John Cabot, sailing for England, made his way to Canada about this time, but not until 1497, after Columbus. As a result, Columbus was nearly universally declared the “discoverer” of America. 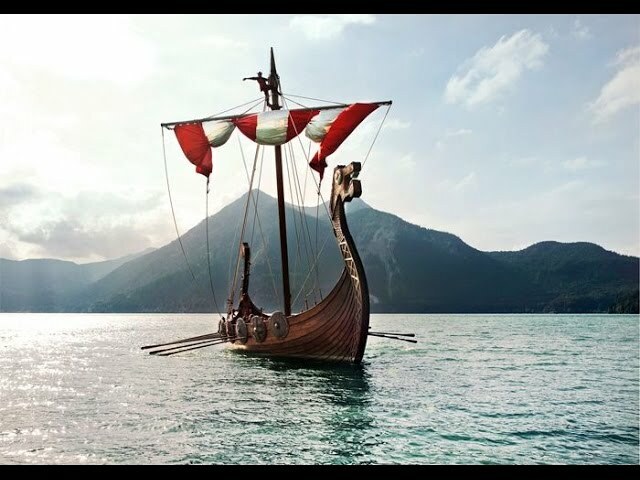 Standing in opposition to that claim, however, were the accounts of Viking journeys to a place called Vinland that appeared in a pair of medieval Norse sagas (heroic prose poems). According to the Grænlendinga saga (“Saga of the Greenlanders”), Bjarni Herjólfsson became the first European to sight mainland North America when his Greenland-bound ship was blown westward off course about 985. Further, about 1000, Leif Eriksson, son of Erik the Red, is reported to have led an expedition in search of the land sighted by Bjarni and to have found an icy barren land he called Helluland (“Land of Flat Rocks”) before eventually traveling south and finding Vinland (“Land of Wine”). Later, following a pair of expeditions undertaken by Leif’s brothers, Thorfinn Karlsefni, an Icelandic trader, led another expedition to Vinland, where it stayed for three years. In Eiríks saga rauða (“Erik the Red’s Saga”), Leif is the accidental discoverer of Vinland, and Thorfinn and his wife, Gudrid, are credited with all subsequent explorations. These narratives of exploration of a place that sounded like Maine, Rhode Island, or Atlantic Canada were thought to be just stories, like “Voyage of St. Brendan the Abbot,” until 1960, when Helge Ingstad, a Danish explorer, and his wife, archaeologist Anne Stine Ingstad, were led by a local man to a site on the northern tip of Newfoundland island. There, at L’Anse aux Meadows, they discovered the remains of a Viking encampment that they were able to date to the year 1000. These dramatic archaeological discoveries proved not only that the Vikings had indeed explored America some 500 years before Columbus’s arrival but also that they had traveled farther south to areas where grapes grew, to Vinland. The Vikings had indeed visited North America, and if they did not “discover” America in the strict sense of the word, they certainly got there before Columbus did.